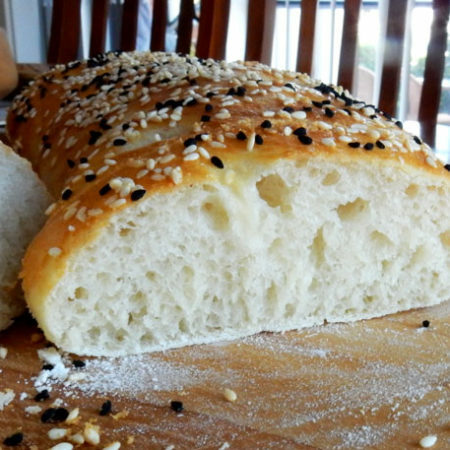 This is a great bread for appetisers, sandwiches and dipping. Combine flour, yeast, sugar and salt in a bowl. Make a well in the centre, then add water. A wooden spoon works best to mix ingredients, then use your hands to bring the dough together in the bowl. Turn the dough onto a lightly floured surface and knead for 15 minutes or until smooth and elastic. Brush a bowl with oil to grease. Place dough in the bowl and lightly coat with oil. Cover with a piece of cling film and set in a warm place away from drafts for about an hour until the dough has doubled in size. Place a baking tray on the middle shelf of the oven. Preheat oven to 230°C / 450°F. Turn dough onto a lightly floured surface and cut in half. Flatten slightly with hands. Place each half on separate pieces baking paper and with floured hands, stretch each piece into a rectangle no wider than the width of your pan. Cover with a damp cloth and set in the same warm, draft-free place for about 15 minutes. Whisk egg yolk and oil in a bowl. Brush the top of each pide with egg and olive oil mixture. Combine sesame and nigella seeds. and sprinkle over the top of each bread then sprinkle the sea salt flakes. Remove tray from oven and slide 1 pide onto tray. Cook for 10 minutes or until golden brown. Cool on a wire rack. When you take the first bread off the baking tray, slide the 2nd one on and into the oven.